What’s the most unusual eating experience you’ve had when travelling? I have heard some horror ones and some of them actually feature in this episode of The Thoughtful Travel Podcast. I am not a very courageous eater when it comes to highly unusual foods but my guests have another approach entirely! Do you think we miss out by not trying all the foods in a place we travel to? Sometimes I would like to be a little more adventurous (and I’m much better than I used to be). Food for thought … pun intended! 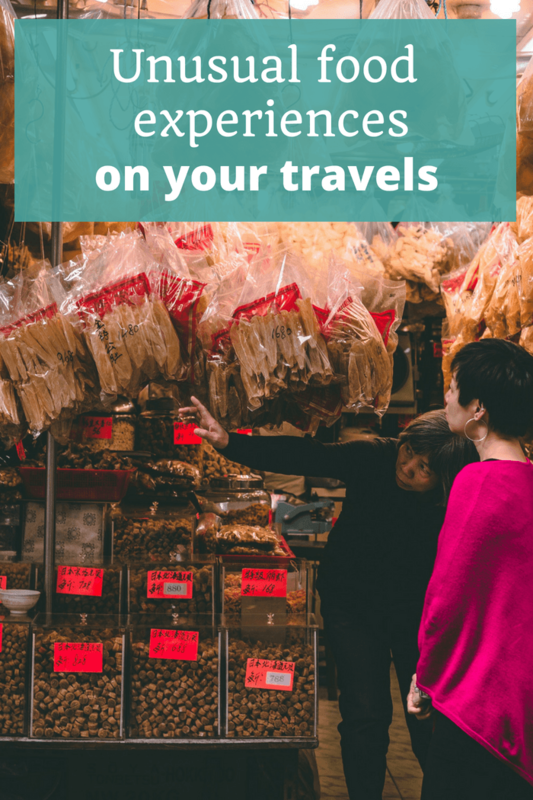 Sometimes food is the whole reason for a trip, but other times, like what we’ll hear about in Episode 106 of The Thoughtful Travel Podcast, it’s the unusual food experiences (planned or unplanned) that are what you remember. In this episode I chat first with Eva Westerling, who had some particularly unusual eating experiences while on a ten-day hike in the desert in Oman. Some parts of this chat are not for the squeamish! Next up I talk with Jacky Lamenzo about comfort food when we travel and about her experiences of eating like the locals when she was a teacher in China. Finally, I talk with Matt and Marilyn from Words With Winos about some of the more unusual foods they have tasted on their travels around the world, particularly in Asia – and if you don’t like creepy-crawlies, you may not want to imitate them!